Canadian Lutheran Online » Blog Archive » Do nothing! He spoke those words in connection with one of the most shocking sections in all of Holy Scripture—the account of Jesus’ visit to the home of those two sisters Mary and Martha. In these few verses we hear Jesus praising the adoring, dreamy-eyed, attentive, inactive Mary who sits at His feet doing nothing and, instead, rebuking the hustling, bustling, active Martha who, after all, is only hustling and bustling about in His interests and for His welfare. But does not Jesus say His disciples are to follow and serve Him? Does not St. James say we are to “be doers of the Word and not hearers only” (James 1:22)? And to all outward appearances and to our way of thinking, Martha was doing the right thing, the God-pleasing thing. In fact, so sure is she of the rightness of her activity that she says: “Lord, do you not care that my sister has left me to serve alone? Tell her then to help me” (Luke 10:40). “Martha, Martha, you are anxious and troubled about many things, but one thing is necessary. Mary has chosen the good portion, which will not be taken away from her” (Luke 10:41-42). What a shock these words of Jesus must have been to Martha! And what a shock these words still are to us today! But why? Why is Mary’s action of doing nothing except sitting at Jesus’ feet and listening to His Word “the good portion, the one thing necessary”? The Scriptures answer: “Without faith it is impossible to please God” (Hebrews 11:6). And further: “Faith comes from hearing, and hearing through the Word of Christ” (Romans 10:17). And what does this mean? Just this: you cannot really serve the Lord unless and until He first serves you. You cannot be a Martha, whose service is pleasing to God, unless and until you are first a Mary who sits at Jesus’ feet and listens to His Word. And that is why the heart and centre, the chief and primary emphasis and activity of every congregation, of every Christian, is to be one thing and one thing alone: “to hold God’s Word sacred and gladly hear and learn it,” as the catechism explanation of the Third Commandment puts it. 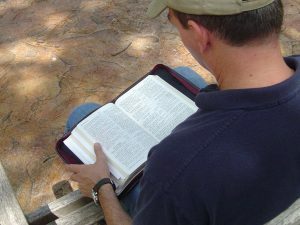 On the other hand, however, as soon as God’s Word is put out of sight and ignored, where the hearing of God’s Word is regarded as only one thing among the many activities that might go on in the church, errors in doctrine and faith, in practice and life begin creeping in so that little by little we lose Christ altogether. And what good will all our serving and doing then be? And what better time for pastors and people in the congregations of our synod to “do nothing” than during Lent. As the rite of the Ash Wednesday service says: “From ancient times the season of Lent has been kept as a time of special devotion, self-denial, and humble repentance born of a faithful heart that dwells confidently on His Word and draws from it life and hope” (LSB Altar Book, p. 483).